Mitsubishi Tanabe Pharma Corporation announced it has received approval to market Radicut® for treatment of ALS in Japan. Mitsubishi Tanabe Pharma Corporation announced recently that it has received approval to market Radicut® (aka Edaravone or MCI-186) for the treatment of ALS in Japan.The regulatory agency in that country, the Pharmaceutical and Medical Device Agency (PMDA), approved Radicut on June 26, 2015, and the approval is strictly limited to Japan. Prior to this announcement, the use of Radicut was limited to aid in the recovery of the brain due to damage following a stroke. A phase 3 clinical trial in Japan began in 2011 and finished enrolling in 2013, and the company presented results to the PMDA in 2014 seeking approval. The next steps for the company will be to inform the medical community in Japan about the appropriate use of Radicut in ALS patients. At this time, it is not known whether or not Mitsubishi Tanabe will seek to achieve approval of their compound in other countries, such as the US. However, the company sought and was awarded Orphan Drug Designation for Radicut by the FDA in May 2015. According to the company, Radicut is a free radical scavenger which works to remove oxygen-containing molecules, which build up in people with ALS and other diseases. This antioxidant approach is thought to provide neuroprotective support to the nervous system, potentially slowing down disease progression or limiting additional damage altogether. However, as with all antioxidants of this type, there are potential off-target effects as well as challenges in ensuring the desired antioxidant affect occurs uniformly in the areas of the body intended for such treatment. In the study, and as approved for use following stroke, ALS patients received 60mg of the compound via intravenous injection daily for two weeks followed by two weeks off. Treeway, a Dutch biotechnology company, announced earlier in 2015 it had begun to reformulate Radicut into an oral medication for further exploration in ALS patients; they were awarded Orphan Drug Designation by the FDA and EU this year as well. 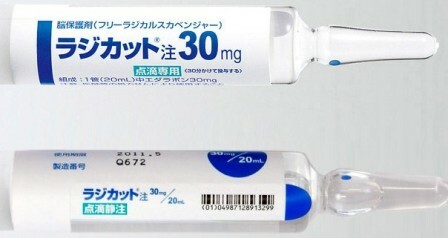 Radicut is approved for use to treat ALS in Japan. However, it is not approved for use in other countries at this time. It is likely the company will continue to seek further approvals, but no timeline has been announced. More information is likely coming. The next steps for the company are to begin to market the drug in Japan and work to inform medical professionals in the country regarding its use in ALS patients. The ALS Therapy Development Institute will continue to monitor the drug's progress and report on it as necessary.